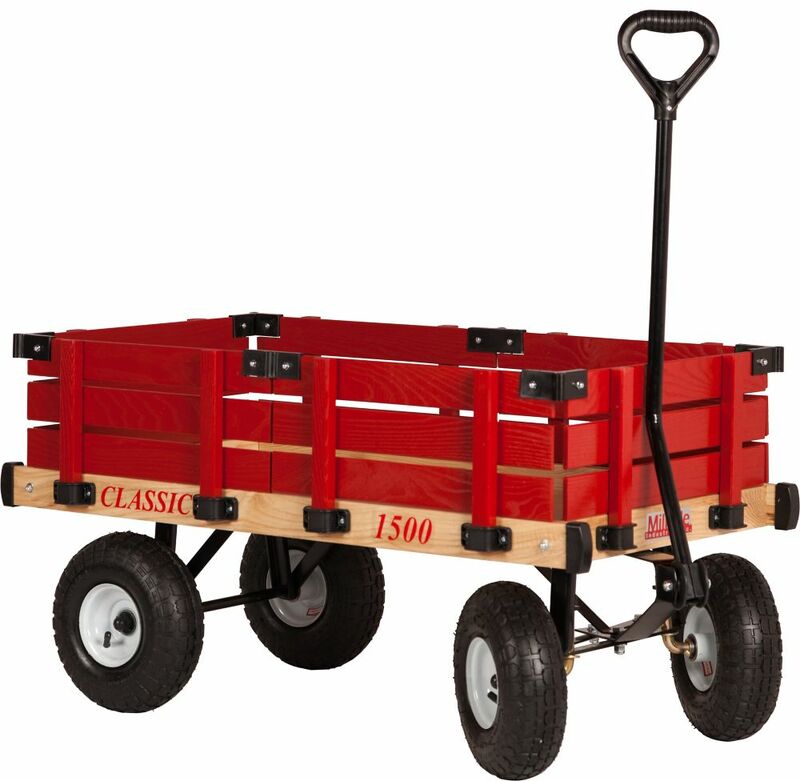 The Classic Kids Wagon...whether it's the morning paper run or the daily task around the home, this wagon is sure to handle the job! The Lewiston Retreat Playset by Cedar Summit is sure to become a new favourite, with so many opportunities for imaginative and active play! The lower clubhouse is the perfect place for your children to expand their imagination and stay busy for hours while the play kitchen offers everything your little chef needs (including a stove, sink, and utensil shelf with accessories). The lower clubhouse also has provides a working door, play phone, a mailbox, and a clock with moveable hands. From here your children can stay active as they climb the rock wall to the upper clubhouse that features a wooden roof and faux stone chimney. After waving through the premium windows, watch as your child cruises down the high rail wave slide or the exciting Twist N Ride Tube slide! Plus, the kids are sure to have a blast as they soar high on one of the two belt swings or hang upside down on the acrobat bar, attached with premium swing components. The most awarded luxury SUV in a kids 12v ride-on version! Fully licensed with incredible attention to detail. Equipped with leather padded seats and three-point harness seat belt for a safer smoother ride. With front storage under the hood and a showroom painted finish this incredible ride will make you wish you were a kid again! Classic Kids Wagon The Classic Kids Wagon...whether it's the morning paper run or the daily task around the home, this wagon is sure to handle the job! Classic Kids Wagon is rated 4.0 out of 5 by 4. Rated 4 out of 5 by bruce from needed alteration this was for a two year old, the railing is not attached to the wagon, just inserted into slot. Two things, first, I accidently pulled the railings out three time just moving the wagon around after putting it together, the two year old did the same albeit only once. second, as the railings are attached to each other, it's rather dificult to get them all inserted into the appropriate slots. I recommend pre drilled holes and screws to attach the railing to the wagon body. other than than, I fine piece. Rated 5 out of 5 by Farmer3 from Love it We got this as a gift for my daughters 1st birthday. It’s very handy for wheeling her around the farm when I have an armload of other things to carry too. Very convenient to put everyone & everything in to the wagon and pull it around. The tires are perfect for going over rough ground & a few inches of snow.